Ellen Sugar signs in at a pharmacy to see a Nurse Practitioner for a flu shot. As the number of primary care doctors continues to shrink, nurses are filling the gap. (CNN) – The number of family doctors in the US is shrinking. That and the implementation of nationwide healthcare reform is creating a void in primary care. Increasingly, nurse practitioners and physician assistants are filling the gap. 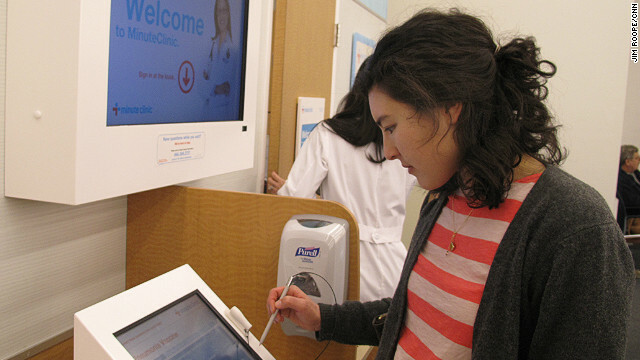 Debbie Polaski is a nurse practitioner and manages CVS’s chain of Minute Clinics in Los Angeles. Many nurse practitioners are being hired by walk-in clinics located inside major pharmacy chains across the country. Clinics like these are where many of the nation's newly insured will be receiving primary health care. I am always amazed at the lack of the general media's understanding of nurse practitioners. We have been around for over 30 years plus add into the fact the MOST of the health care delivered worldwide is by a NURSE you would think CNN could have some better insight into the profession of nursing NPs are not in "competition" with MDs. We are registered professional nurses with master's degree (which will soon be elevated to a doctoral degree) to practice as an NP.) We provide medical care as nurse with advanced education and certifications. Physicians are our colleagues, not the “other guy’. I am a Nurse Practitioner that is an addiction and HIV specialist, and run a primary care clinic for a non-profit organization. I practice primary medical care as a nurse. I do not have any desire to be a physician. I am proud to be a NURSE. In my advanced practice role I assess, diagnosis, and treat medical problems that are acute, chronic, and life-threatening or anything else for that matter. I do not spend my days "giving out flu shots" or taking care of boo-boos. I see complex and complicated patients with multiple diagnoses and provide, what I believe is, state of the art evidence based medical and nursing care. As any other health care professional I consult with MDs, other NPs, social workers, dieticians, and many other members of the health care team. Good health care is a team effort. However, the vast majority of the time I read about NPs in the mainstream media I feel like I have fallen down a time tunnel to the past. The stories are laden with sexism, poor insight, and a tremendous amount of lack of facts about NPs and the health care system. I challenge CNN, or any other media outlet, to do a fact based article on Nurse Practitioners and stop feeding the tired and old (and incorrect) facts about the profession of nursing and Nurse Practitioners. CNN could be a leader in getting it right. I have been a physician in a NYC hospital for twenty years. We incorporated physician assistants as well as nurse practitioners into our practice about 10 years ago and they have been an equally tremendous asset to our staff. I consider them both to be my colleagues. Thanks, but I'll take a doctor instead. You have no idea the behind the scenes of a doctor's office. NPs are holistic in their approach, doctors tend to look at the issues you are having right now, not reviewing your medical record previously or studying you as a patient. You are clueless! Working in the medical field for 15 years I would rather go to an NP for the majority of my issues....just maybe not major surgery. I am just a regular RN but I have to say, I've had much worse experience with P.A's than NP, much worse, my daughter had kidney stone symptoms, the pain was intermittent, we went to urgent care and a P.A. said "It can't be a kidney stone, the pain is alwasy constant" Having worked as a nurse for years I knew that was total BS and sure enough an US showed the stone, An employee came to our clinic stating he had a bad earache and had been on ATB for 5 days for a middle ear infection ( I am an occupational nurse at a large plant), after seeing the same P.A at a local urgent care. I looked in his ear and told him I couldn't tell anything because he had a wax impaction, so I called the office that oversees the urgent care, and they had an ENT see him, no infection just an impaction, ridiculous, anyone with any training could've picked up on that, I could keep citing these cases. Ha! I agree, PA are want-a-be doctors and seem to have a chip on their shoulders like they are almost a doctor...but....I just could not do it. NPs are the way to go for the majority of issues, they have worked the inpatient floors, worked the RN arena, look at things holistically. I think it's common knowledge that ou can't judge an ENTIRE occupation, race, religion, etc etc. based off a few people, in your case ONE person. There are millions of Americans who are treated by PA's and NP's and get quality care, and for you to write them all off like that is very ignorant and shameful. TJ – If you have so much experience with upper level health care then you should clearly be aware that you need to appropriately cite your sources if you are going to make such claims. Show me a powerful study that backs up your statements, otherwise they are just hearsay. Thanks for trying. Im in CRNA school and took classes with PA students and Med students, grades dont lie, my CRNA class outperfomed the Student MDs and PAs by 15-20%. Most of the PA's I've seen are woefully underqualified and very full of themselves. NP's have been the unsung heroes of filling the treatment gap – and have provided valuable and quality services. Look at Pediatrics and OB-GYN if you need to see the impact. It's so typical to slam the nursing profession – there is so much ignorance. Medical culture within ObGyn and Peds is to hire NPs. If you go to surgery teams or emergency medicine, you are more likely to see a PA than an NP. Of course, this also varies from hospital to hospital and state to state. I work for a surgical Oncology group with about 4 other NPs...no PAs. TJ, I would love to know where you get your information from? Higest rate of medical mismanagement? What journal was that statistic published in? 25+ years in medical imaging...as what? A tech? As you can probably tell, I am a nurse practitioner and I take offense to your comment. I am none of those things that you say and nor are my colleagues. If you did your research, you would find that NPs have more medical training that PAs which is why we can practice INDEPENDENTLY and not attatched to a physician like a PA. NPs are required to have 4 years training in nursing (BSN), 3 additional years in graduate school and need to pass a national certification exam. PAs have an undergraduate degree in just about anything (it is not required to be biology) and then 3 years graduate. NPs only practice within their scope and are often told that they were "better than an MD". Trust me, there are plenty of physicians that over order diagnostics b/c they have no idea what is going on with the patient. I still can't seem to understand how you would know if a test is being over ordered just b/c you work in an imaging center? You have no idea of why a patient is even there other than he might need a test. Learn the facts TJ b/c you are completely ill informed. Nothing like throwing in your own bias, NP. Especially since doctors "over order" test in order to cover themselves from the constant fear of malpractice, not because they "have no idea what is going on with the patient." Really? We have to go to medical school (unlike you), go through 2 years of hospital rotations (unlike you), take at least 3 different Board exams (unlike you), and spend at least 3+ years in a residency training program (unlike you). So don't throw your ignorance into this discussion that doctors are incompetent. Sensitive, sensitive. The point that I was trying to make to TJ's comment was that NPs are not the only ones that "over order" that some MDs do it it as well. I never said that doctor's were incompetent, however, they are not a perfect group though some would like to believe that they are. I don't know why you felt complled to list your qualifications....an MDs education was never in question. It is obvious that you have more. You all see the requirements for becoming a nurse practitioner? Pretty scary. Stick to physician assistants if you have to go cheap, at least there's some guarantee of them being supervised by a real physician in office. And before the "experts" in the forum begin to whine, I have 25+ years experience in medical imaging, and by far the most complaints about treatment, the most excessive use of ionizing radiation due to over ordering imaging examinations, and highest rate of medical mismanagement are attributed to the least educated of the medical professionals – nurse practitioners. Their motto is "if you can't diagnose, then test till you can".